For some reason I was struck by Burda 06-2013-128 when the magazine arrived. It looked cute and easy to wear--and easy to sew, too, which can be a bonus sometimes. 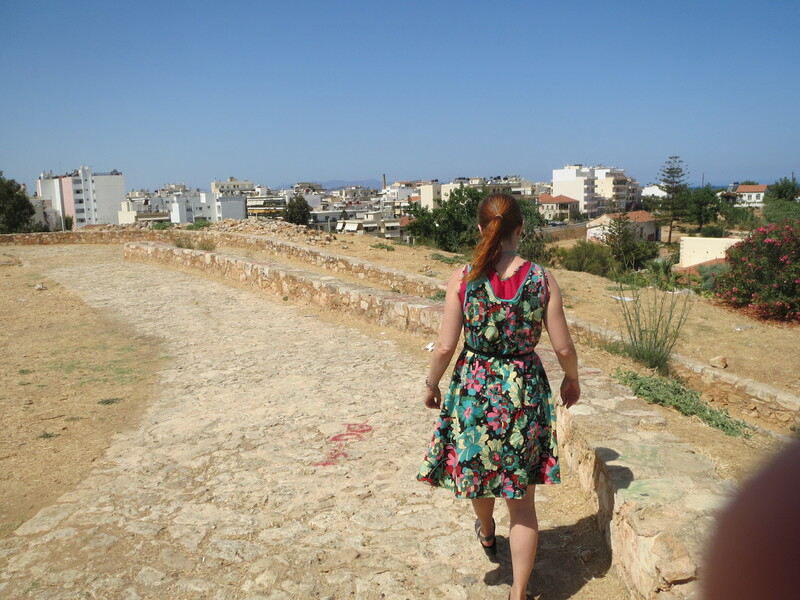 I decided to add it to my sewing for my trip to Greece. I didn't do the waistline casing (actually, I couldn't even tell from the instructions whether you were supposed to do a casing or use elastic thread in the bobbin). The waistline shaping here comes solely from the sash, which I tied loosely in the hot weather for more wearing comfort. 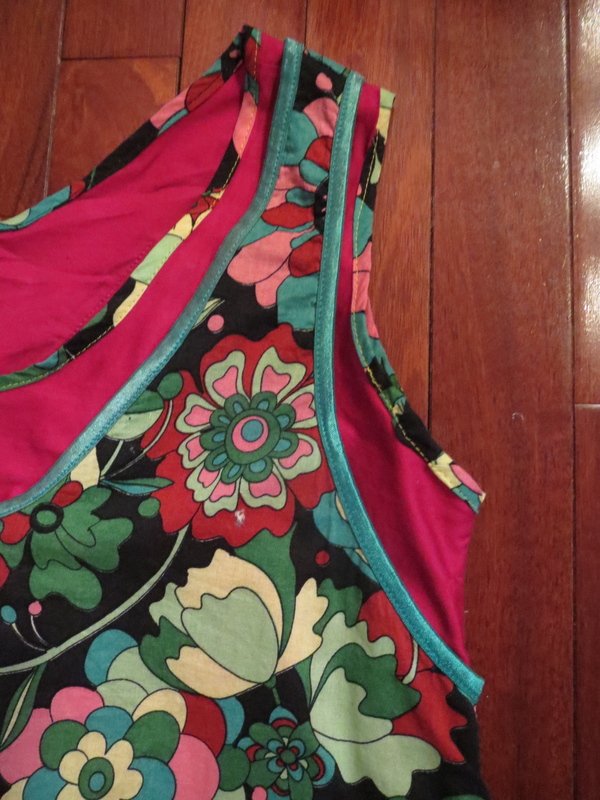 I finished the neckline of the pink underlayer with bias binding made from the floral outer layer. I ironed it so that one side was longer than the other so I could put the longer side on the wrong side and sew it on in one pass. 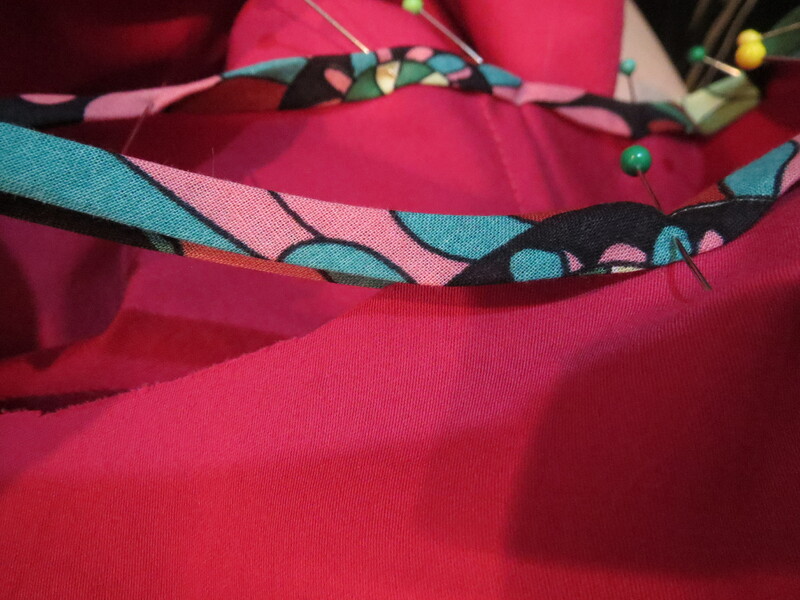 I didn't do *perfectly* at sandwiching the body of the dress and had to rip it out in a few places where I'd missed the dress altogether, so I'm not sure it was any faster than my usual two step process, but it was an interesting experiment. I used foldover elastic to finish the floral overlayer. Because my fabric was a woven with no stretch I didn't stretch the elastic as I would have for a knit. I sewed the FOE in one pass as well, and as with the bias tape it mostly worked, but I had to rip and resew a few places. I should have stretched the FOE very gently as I was applying around the curves of the center front and back, because it doesn't sit totally flat. I ended up sewing the outer layer to the inner layer at the center front and back to get it to lay flat, as well as in the ditch of the shoulders and the side seams under the arms for a few inches to prevent shifting. While I was making it and even once it was done, I wasn't totally sure that the self bias tape didn't make it too juvenile. Who knows. It's a casual, fun, summer dress so I suppose a little Garanimals isn't the worst thing ever. I had to drastically shorten the shoulders, 1 inch in front and 1/2 inch in back (I am short from chest to shoulder, presumably due to the small bust, so I always have to shorten the front more). I had shortened the front shoulder about 1/4" before cutting, but obviously that was only a fraction of what it needed. I don't usually find Burda to be incredibly long from shoulder to bust so I'm not sure what's going on with this pattern. Because of the shortening, which I did not do on the outer layer, my inner layer shows more than the design is intended to at the neckline and armscye. The hemline is also very long. I shortened it 1 1/2" before cutting, and another 1 1/2" when I put in the hem, for a total of 3 inches shorter than drafted to get a just-above-the-knee hemline. 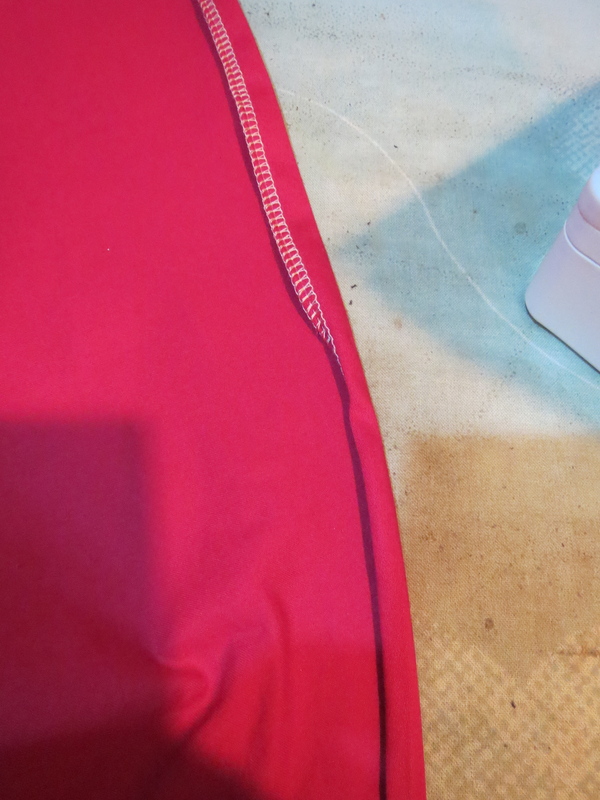 I did narrow hems on both layers, serging the edge, then pressing under along the serging line, and finally pressing under again. 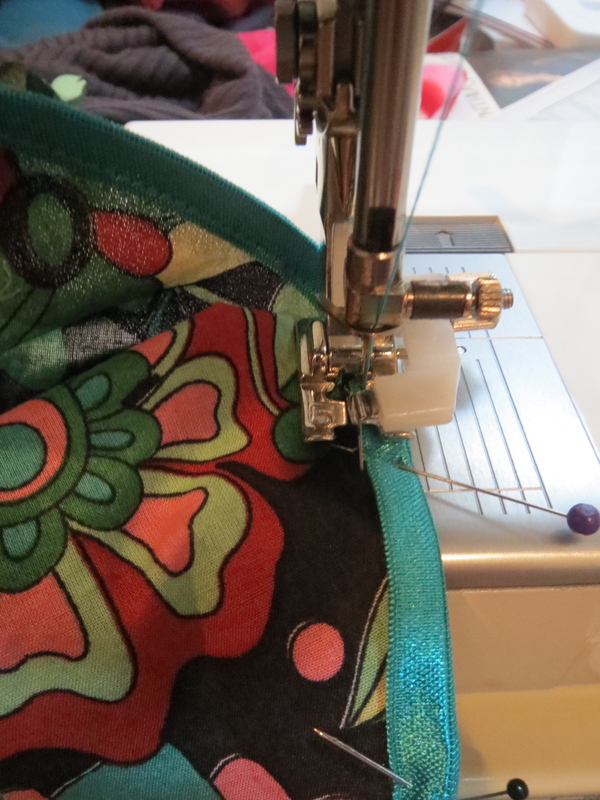 This isn't a baby hem, obviously, but I find the serger width very convenient for getting a nice even hem. I love the idea of getting a peek of the underlay fabric at the hem. 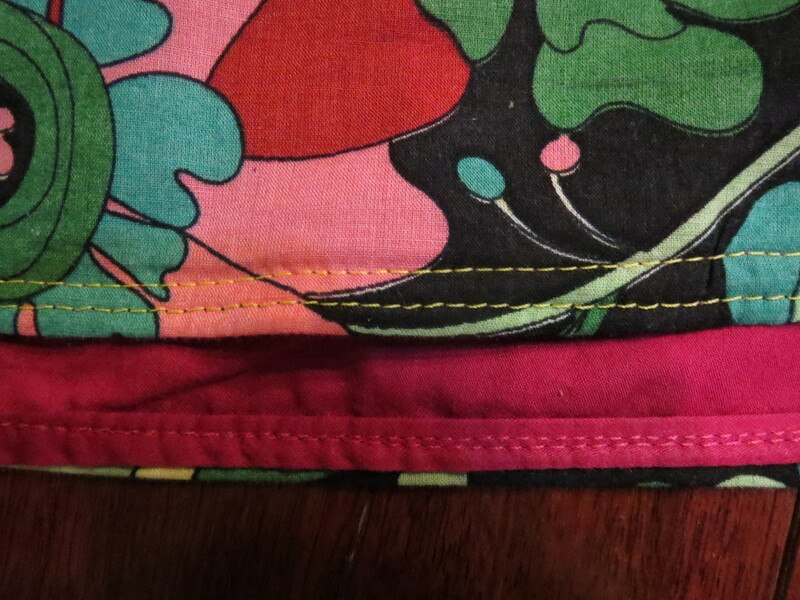 I hemmed the two layers separately to the exact same length, and then stitched the layers together. I considered doing a subtle high-low hem, but that seemed like too much. So you're really only going to get an occasional glimpse as the dress is in motion, but I know the detail is there. I cut the center back with a seam. I didn't add any shaping or do any swayback adjusting, but because of the width of the skirt it uses vastly less fabric. If both pieces are cut on the fold I don't think any fabric is wide enough that you don't have to cut them from separate lengths. Cutting the back with a seam means you need almost half as much fabric. This is just personal preference, but I don't like how low the back neckline is. I don't think it adds much the style, it promotes gaping, and I find it inconvenient for bra purposes. You can still get a double layer look with a higher back neck. My two fabrics were a good match here. The pink underlay is an Ikea sheet purchased several years ago ($14). I bought two of these sheets several years ago. 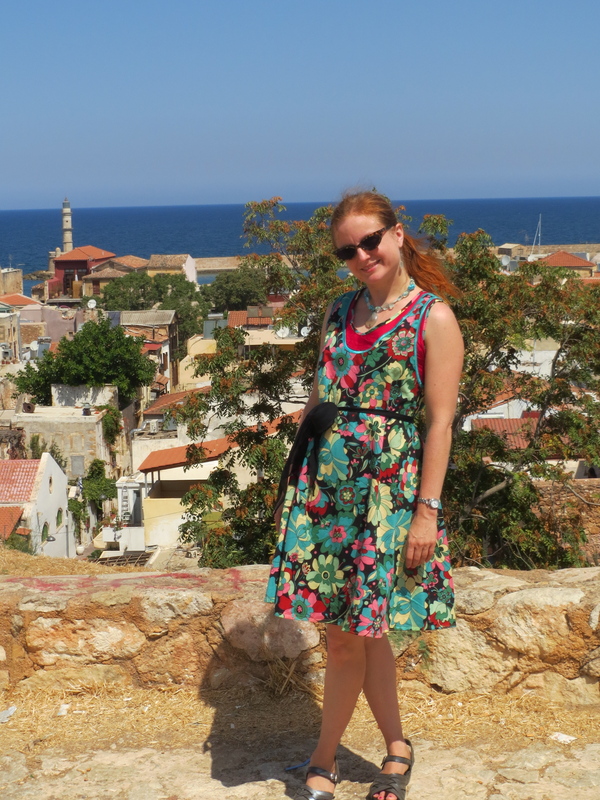 I made the green sheet into Butterick 5320. I love the color, the sheen, and the body of the fabric, but it wrinkles horribly. The floral overlay is an extremely lightweight cotton batiste ($3/yd) from our epic trip to Fabric Mart last November. It's too light use on its own for anything other than a simple top, and I wanted a dress of it. So the sheet gives body to the batiste, and the batiste hides the sheet's wrinkles. At first I was concerned about how sticky-outy the sheet fabric is in the skirt, but then I decided I love it. It's almost a petticoat in itself! With some modification to the shoulder and the back neck, I really like this pattern. I can definitely see making it again as a single layer dress. It's a good pattern for a large print because the front and back are each just one piece. And you know how much I love a large print.